Today, DevOps is helping companies address the software development and delivery challenges by engaging both the operations and development teams in a single development sphere. Beyond enhanced delivery and support, DevOps provides room for innovation driven by the latest trends such as big data, cloud computing, and mobile applications and social media support. Open source tools are crowding the DevOps landscape, attracting bigger organizations to adopt the agile practices advocated by DevOps. These practices spawn greater customer satisfaction, better communication, integration, and collaboration within the development life cycle. Although most enterprises uphold that software development and delivery are critical to profit-making, an IBM survey reveals that only 25 percent believe that their teams are effective in terms of execution and delivery. Migrating to a DevOps environment applies agile and lean practices across an organization and maximizes the speed of delivery of a product or a service, from the initial development stage, to customer feedback, to enhancements based on the feedback. DevOps strategy has evolved over time, leading the solution providers to develop their own reliable toolkits and interfaces. Software developers can adopt these principles with a holistic DevOps approach to reap the benefits of agile development. DevOps providers are regularly updating their toolkits and APIs to support more verticals. In some cases, they are also developing tailor-made suites to service clients better. Ultimately, DevOps improves the way that a business delivers value to its customers, suppliers and partners—it can be considered as an essential business process, not just an IT capability. As a prelude to CIOReview’s 20 Most Promising DevOps Solution Providers, our selection panel evaluated the capabilities of several vendors who provide agile solutions to businesses. A distinguished panel comprising of CEOs, CIOs, VCs, industry analysts and the editorial board of CIOReview selected the final 20. We present you CIOReview’s 20 Most Promising DevOps Solution Providers 2015. Ammeon Offering consultancy and open source solutions to accelerate service development and delivery. Ciklum Provide ongoing resources that sustain growth with the flexibility to scale up projects. EnterpriseWeb LLC EnterpriseWeb is as a platform provider delivering enterprise class applications at web-scale, driving more dynamic, connected, and adaptable business operations. GoVanguard Devops as-a-service solutions Offered with Continuous Integration Automation, Analysis, of Infrastructure along with end point monitoring and application monitoring. Intland Software Developer of a fully web-based Application Lifecycle Management(ALM) solution. Isomorphic Software Provides SmartClient, the most advanced, and complete HTML5/ AJAX technology for building enterprise business applications. ITapp Accelerates continuous delivery pipeline—model, deploy, and manage end-to-end application stacks—developers consume via self-service UI or APIs while IT controls access and quotas. ObjectFrontier Software Specializes in building and deploying digital products that drive revenue. Using the latest in social, mobile, analytics, and cloud computing, OFS builds software that engages the customer and transforms their business. Prolifics Global IT solutions provider, providing end-to-end services including architectural advisory services, design, development and information management and analytics solutions. Qwinix Technologies An application development and software solutions provider specializing in Agile Development, Lean Thinking, Continuous Delivery and DevOps using a global delivery model. Rackspace A leader in managed cloud with technical expertise and Fanatical Support that allow companies to tap the power of the cloud without the pain of hiring experts in dozens of complex technologies. ReleaseTEAM A consulting company specializing in DevOps and Software Configuration Management. Ruxit Full-stack availability and performance monitoring for DevOps teams with artificial intelligence that detects and analyzes all dependencies between websites, applications, services, hosts, networks, and cloud infrastructure components. Soha Systems Soha Systems delivers application security for the cloud-enabled enterprise. Sonatype Sonatype’s Nexus platform provides speed, efficiency and quality across the software lifecycle with software supply chain automation. Spirent Communications Provides integrated automated continuous testing and lab orchestration tools and solutions that accelerate DevOps development to delivery pipelines. 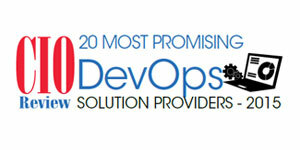 Also best DevOps practices assessments and services. Splunk Provides developers with new visibility across the product development lifecycle so they can quickly pinpoint code-level issues at any layer of the stack. Tricentis Provider of enterprise software testing solutions that enables enterprises to achieve unprecedented automation rates while maximizing business risk coverage. VictorOps A real-time incident management platform that combines the power of people and data to embolden DevOps teams so they can better handle incidents. XebiaLabs Provides delivery automation software that helps organizations deliver business value faster and more efficiently.